Brought to you by Manhattan Toys. Manhattan Toy has created a fun new toy line for little boys (and girls) that love cars and trucks. 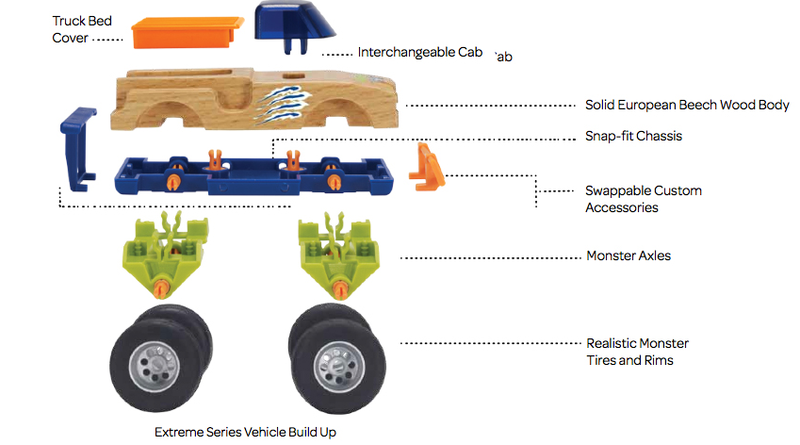 It is called the Motorworks line and includes 9 different vehicles that have interchangeable parts as well as upgradable accessory kits to create customizable vehicles! Both of my boys are obsessed with cars and trucks and were super excited to receive two vehicles from the Manhattan Toy Motorworks toy line! My older son, 7, loves Monster Trucks so he chose a monster truck and my younger son, 2, loves trucks in general so I chose the pick-up truck for him. I also chose an accessory kit, the monster truck wheels so I could upgrade my little guys truck into a monster truck like his brothers! There are three series of vehicles in the Motorworks line. All vehicles feature an interchangeable cab, solid European beech wood body, snap-fit chassis and realistic tires with removable rims. The street series offer the core components of the Motorworks collection. The three models include an XT Sport 1.0, a GT Road Racer 1.0, and FX Tuner Wagon 1.0. The speed series vehicles feature accessories that evoke sleek, aerodynamic lines that are sure to break the speed limit! The vehicles also include interchangeable custom accessories that will fit the other vehicles in this line. The series includes EXS Ground Effects 1.0, STS Police Chaser 1.0 and FSS Flareside Truck 1.0. The extreme series is inspired by monster trucks and dragsters. These also include interchangeable custom accessories that will fit the other vehicles in this line. The series includes FSX Monster Truck 1.0, STX Patriot Dragster and FX Fire Chief 1.0. We chose the monster wheels accessory kit, FSS Flareside Truck 1.0 from the speed series and FSX Monster Truck 1.0 from the extreme series. We added the monster wheels accessory kit to the flareside truck to make it look like a monster truck! Here is the FSX Monster Truck, I love the colors! My boys love playing with the trucks, and I love how easy these are to put together. They are made for children age 3+, however, my 2 year old son can snap with wheels on and off on his own after I showed him a couple of times. The trucks come fully put together with the stickers on, so all I had to do was remove them from the packages. I was so happy because my kids are very impatient when waiting for me to get toys out of the package so the fact that I can open the package and hand them the trucks was excellent! The Motorworks toy line is perfect for any child that loves cars and trucks. They can take them apart, customize them the way they want to and upgrade them with the accessory kits! We absolutely love the trucks and my boys will be able to enjoy them for a very long time because they are so durable. You can purchase these items and more from the Motorworks series on the Manhattan Toy website! Enter below for a chance to win your choice of Manhattan Toys Motorworks Customizable vehicle package! Giveaway is open to US only, age 18+. Void where prohibited. Giveaway ends at 11:59 on 5/8. Love the Police Cruiser. Great looking toys. I like the STS Police Cruiser 1.0. How cool is that. My son would love the EXS Ground Effects 1.0. Love the Extreme Series- FX Fire Chief! My nephew would absolutely LOVE it!!! I like the tri level super garage. I like their EXS Ground Effects series! I like how they have both family style cars and sporty cars. I like the FSX Monster Truck 1.0™. I like the super power packs. I like the STS Police Cruiser 1.0™ ! This is awesome- you get exactly what you want!